The capital of the most north-eastern of Poland's provinces. Suwalki isn't a prime dark (nor mainstream) tourist destination, but primarily a convenient place for a stopover when touring the north-east of Poland, and perhaps for carrying on into Lithuania. It does offer a couple of minor dark attractions of its own too, though. What there is to see: first and foremost there is the town cemetery. 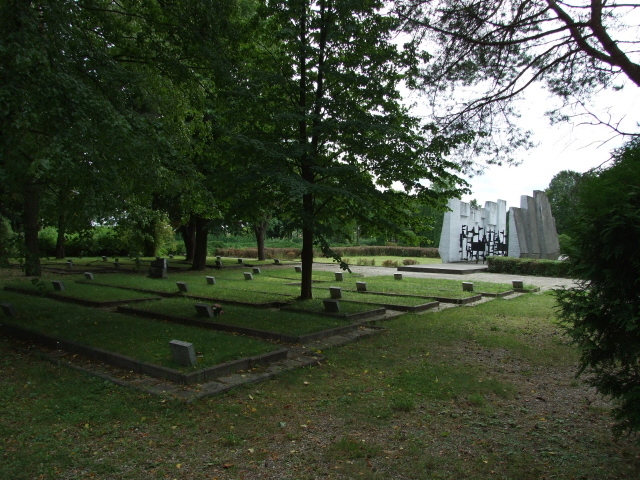 It is subdivided into various sections, of which the former Jewish part is a poignant reminder of a) the near complete disappearance of Jewish life (and even graves) from this area, due to the Holocaust during World War II and b) the fact that the repercussions of Nazism are still not fully overcome. 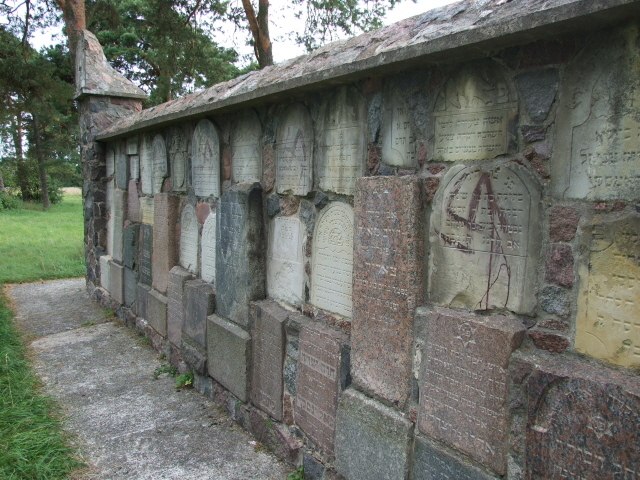 The area that the former Jewish cemetery covered is largely empty today, except for the odd remaining grave and, in particular, a wall made of fragments of Jewish gravestones which were smashed up by the Nazis back then. Much more recently, this monument has shockingly been daubed with several swastikas. I had already read about this disgrace on the Internet in an article dated March 2007. When I visited in August 2008, the swastikas were still there! Obviously nobody felt a need to remove them. In fact, some of the swastikas seemed to be more recent additions, in brown colour at that! These looked less faded than the white ones I had seen photos of. But the latter were still quite visible too. I am of course aware of the fact that Poland has a neo-Nazi problem of its own …. though how this is possible in a country that suffered so much at the hands of the Nazis will forever remain completely beyond me. Near the entrance to the former Jewish cemetery section there is also a small monument to the Jewish victims of Nazi terror. It bears some scratch marks and traces of dripped paint, suggesting that there have been attempts to deface even this monument too. It really does come as a shock to see such defacing in this remote part of the country – and the obvious fact that no one can be bothered to do anything about it (or at least not enough) is equally disgraceful. But enough of this. The Catholic part of the cemetery, needless to say, is well kept, spotless and busy. There's also a monument to 9/11 (see Ground Zero) – one victim of that atrocity was a local from Suwalki, apparently. 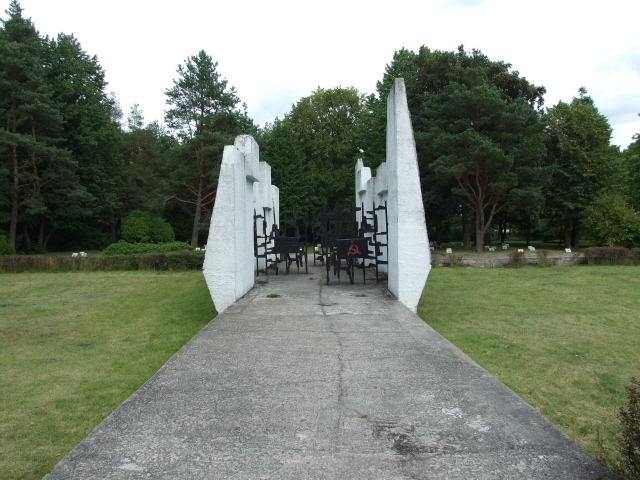 The monument and cemetery are located near the place where a POW camp was set up by the Nazis in World War II. The camp's atrocious conditions claimed tens of thousands of lives. No visitable traces of the camp remain today. 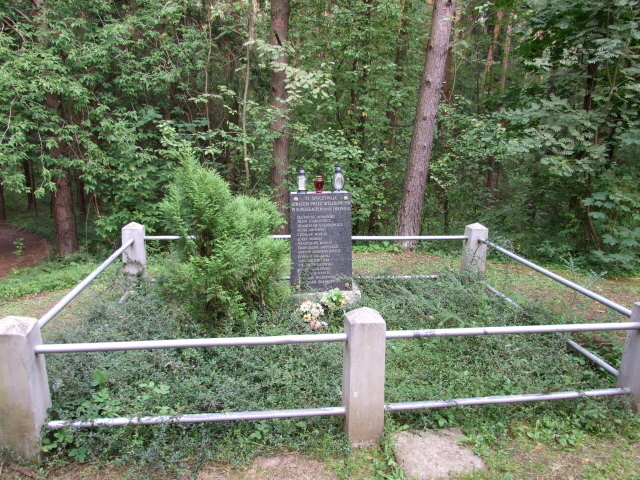 However, a short walk into the woods next to the Soviet war cemetery/monument there's another small Polish monument – to Polish victims of Hitler's Nazis. If you’re staying in Suwalki anyway, you could just as well also take in a bit of Suwalki itself, especially the central parts. The place has a certain charm of a very eastern, almost Russian nature. The landscaped central square, dominated by a rather imposing church building, forms the natural focal point of the town. Allegedly it was also believed that this was the geographical centre of Europe, accordingly marked by a little monument – although now it is generally accepted that this title more rightfully belongs to a place in Lithuania. Location: in the far north-eastern corner of Poland, some 80 miles (130 km) north of Bialystok, 170 miles (270 km) north-east of Warsaw, and within a couple of dozen miles each from the three borders with: (anti-clockwise) Belarus, Lithuania and the Russian enclave of the Kaliningrad Oblast. Access and costs: quite remote, but not too difficult to get to; fairly inexpensive. Details: Suwalki has both train and bus stations, with connections to/from Warsaw. However, most dark tourists coming to this remote part will do so by car. Only this way will you have the necessary flexibility needed when checking out the dark sites of north-eastern Poland (and possibly Lithuania too, esp. Grutas Park), as these are typically not so easy to access otherwise. Suwalki makes a good stopover on such a tour. It also offers reasonably priced accommodation and all sorts of amenities of a small town (ca. 75,000 inhabitants) and regional capital. The town cemetery is located to the west of the town centre, at a walkable distance from the town square and main high street (ul. Kosciuszki). Take the street branching off west in a right angle at the southern end of the central square (ul. Mickiewicza), cross the river and turn left into ul. 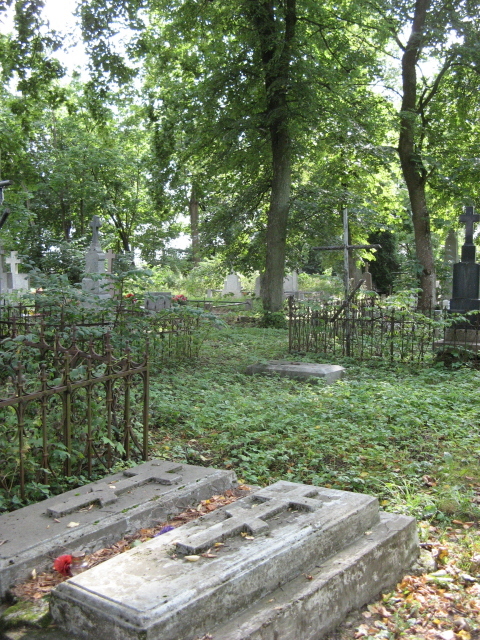 Zarzecze, which runs along the cemetery's eastern wall. The first section, closest to the town centre is the busy Catholic part. 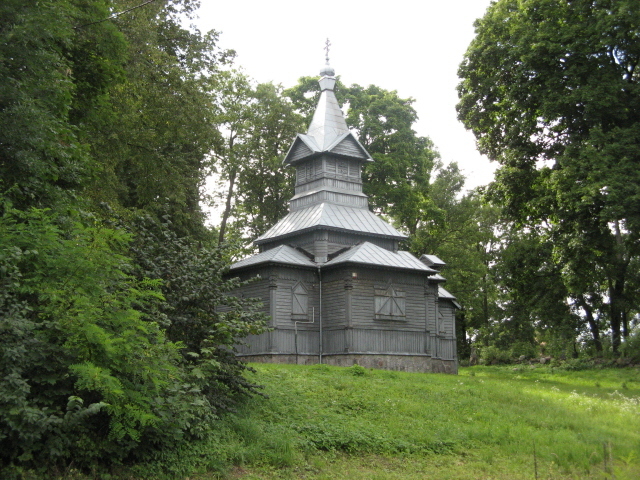 Next is the overgrown Orthodox section marked by the grey onion-domed chapel. Access to the inside of the section may not always be possible but you could peek through the fence/gate (the chapel will most likely be locked). 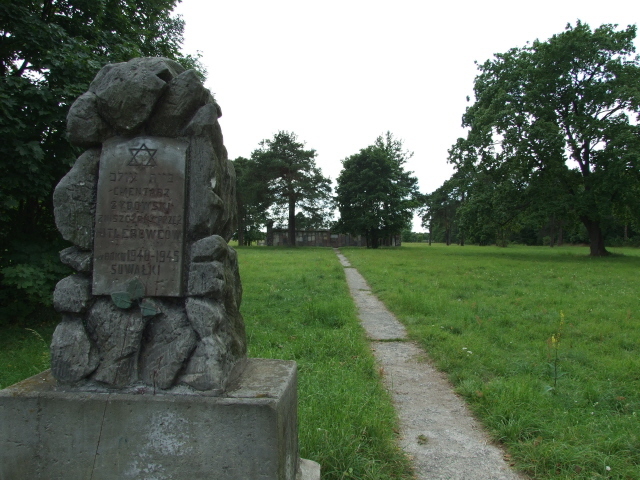 Further south is the former Jewish section with its forlorn-looking memorials. There should be access to this at all times. Obviously, visiting the cemetery is free of charge. 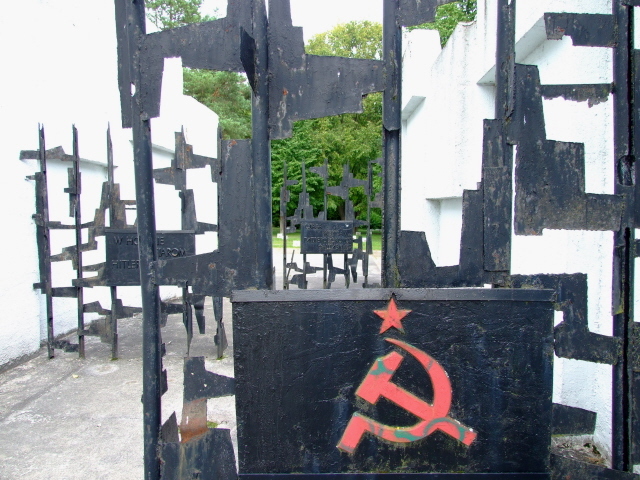 So is the Soviet war memorial and cemetery to the north of town. But this is a bit too far out to be comfortably walkable. Take ul. Mikolaja Reja, that's the 655, straight north in the direction of Jeleniewo and Rutka Tartak. Soon after you'll pass the last few of the drab concrete residential blocks – as almost everywhere in the former Eastern Bloc these are characteristic of the outskirts of towns. Then you'll draw closer to a new-ish cemetery with a large car park. Use this, as it is next to the Soviet war memorial and cemetery, which doesn't have a car park of its own. To get to the Polish memorial in the woods you'd first have to walk further along the roadside until you get to a small sign where the path into the woods branches off. Time required: Both the cemetery in town and the Soviet war memorial/cemetery can be done in about half an hour each, plus time to cover the distances to get there. It's worth allowing a bit of extra time for a worthwhile stroll around the central parts of Suwalki itself too. 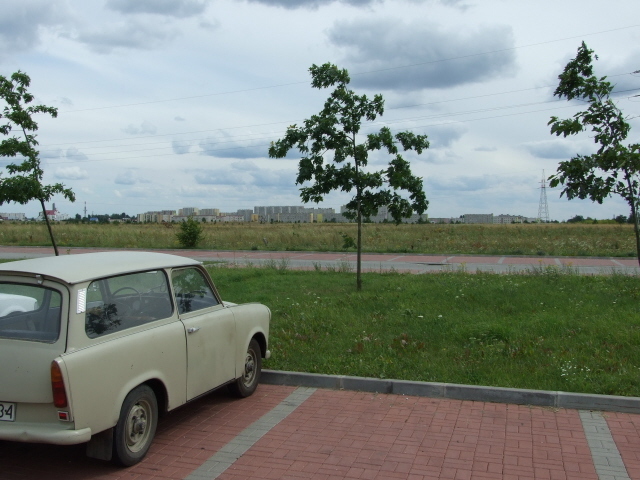 Combinations with other dark destinations: Most dark tourists coming to Suwalki will only do so to use it as a stopover, so combinability is what it's mostly all about. The most likely scenario is that Suwalki will serve as a Polish stopover en route to/from nearby Lithuania, in particular Grutas Park. The latter can also be done as a day trip from Suwalki. Coming in from the west, or going east towards the north-eastern principal dark attraction, Wolfschanze near Gierloz, you can choose a route closer to the Russian border (via the road 650 that connects Goldap and Wegorzewo) and that way take in the enigmatic and somewhat morbid Rapa pyramid (a mausoleum). If you come on a route from (or go on to) Warsaw, via Bialystok, say, then you should incorporate the slight detour to take in Treblinka. This is one of the very darkest sites in the whole of Poland and a must-see for the dedicated traveller seeking out sites of the Holocaust. For other items combinable only on a longer exploration see Poland in general. One more thing: a not so much dark, but a fairly weird attraction that could easily be combined with the drive to/from Suwalki is the double viaducts of Stanczyki. 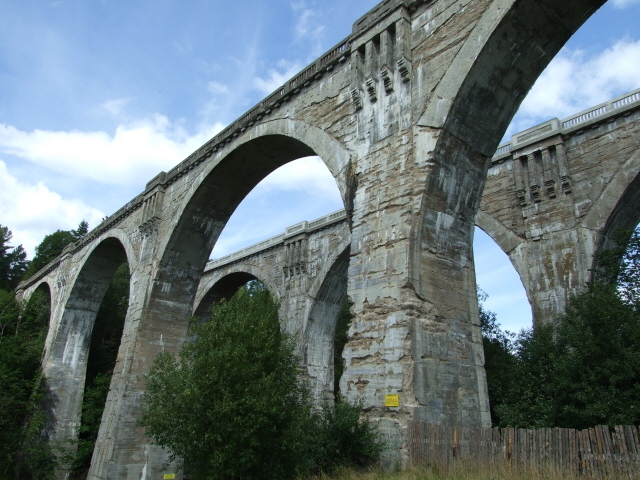 These resemble Roman aqueducts but were actually built by Imperial Germany before World War One as railway bridges on the planned Goldap-Zytkiejmy line, specifically as a scenic viewpoint for train passengers. No train-line actually ever arrived, however, so they just stand there in the landscape as odd relics of a past that never really was. The viaducts/bridges are quite stunning structures to behold from the bottom too. They are almost 200 yards long and form five graceful arches each, more than a hundred feet over the small river Bledzianka and its wooded valley. There's a car park at the bottom. 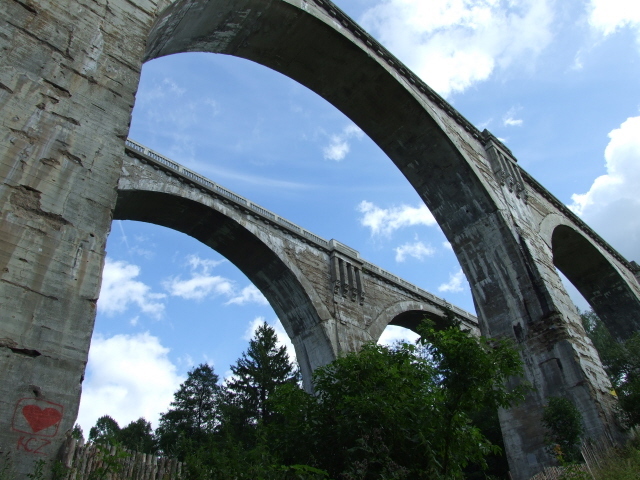 The fee for using it was 3 zloty in August 2008, and access to the viaducts was charged for too – 2 zloty. It's clearly popular with locals, which probably helps keeping the price low – in fact at least 99% of visitors were Poles; foreign visitors are a rarity here. It was possible to get close to the bottom of the arches but a fence prevented you from actually walking under them – probably to protect visitors from crumbling and falling concrete. A path up the slope to the southern end of the viaduct leads to the top. During my visit in August 2008, one of the viaducts was being renovated and was closed off. But you could still cross the other one and take in the views from above. It's likely that once the renovation on the one bridge is finished it will be opened for public access while work begins on the other one. You can see why renovation work is indeed needed – the nearly one century old concrete isn't the most stable any more. Note also the exposed timbers on the side of the arches – as an early form of reinforcing concrete. Wooden logs were used instead of steel. To get there: coming from (or driving on to) Goldap don't use the shorter route via the 65 and 652, but the 651 and 655 further north. 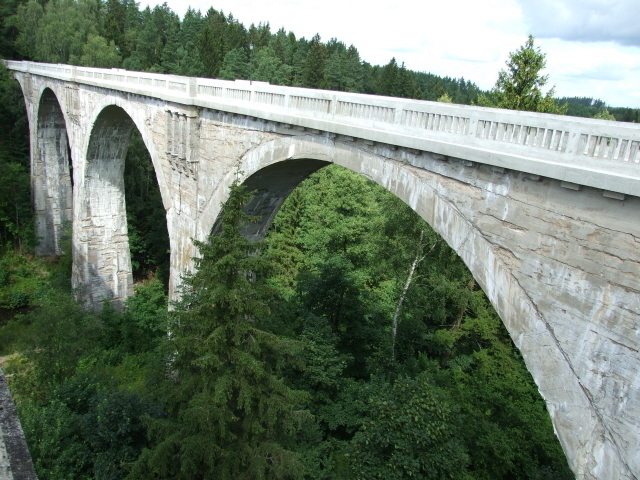 The Stanczyki viaducts are located a short drive off the main road, roughly halfway between Goldap and Rutka Tartak. The latter is where the 651 and 655 meet. So coming (or going) that way you can also take in the Soviet war memorial/cemetery north of Suwalki just outside town directly by the 655 road. Combinations with non-dark destinations: The area around Suwalki is one of the least visited parts of Poland, and that alone has its 'exotic' attraction. Furthermore, it has some very scenic bits and pretty unspoilt nature reserves. The closest to Suwalki is the national park around Lake Wigry to the south – a superb spot for nature lovers (and even more so for the rich wildlife here). North of Suwalki there are further nature reserves (one just north of the Stanczyki viaducts), and an important archaeological site is located just to the north-east of the town by the main road, No. 8, to Lithuania: the burial mounds of the ancient Jacwingian cemetery dating back to at least the third century AD (if not earlier). 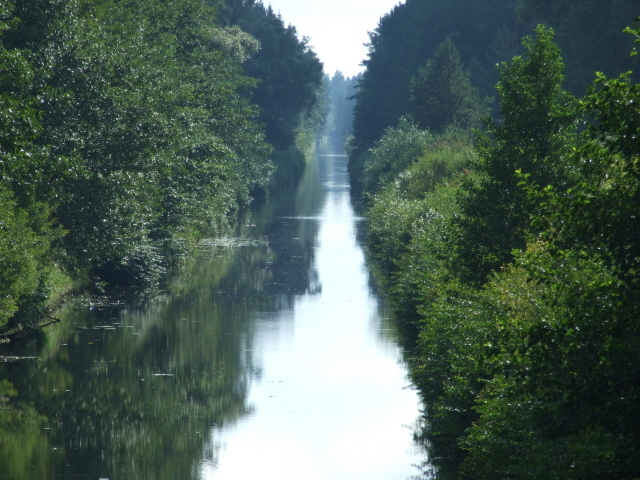 The prime attraction of the area, however, is the Augustow canal and the forested Puszcza around it. There are organized boat trips from the holiday town of Augustow, and various roads lead to points at which you can admire the canal from bridges without actually travelling on its waters ... although that has to be the ultimate way of doing it – stretches of the canal are totally isolated! Further south, beyond Bialystok and straddling the border with Belarus is the famed wilderness of Bialowieza National Park, reputed to be Europe's most significant remaining primeval forest and home to the iconic European bison. And finally, to the west west lies northern Poland's main general tourist draw: the Masurian Lakes (cf. under Wolfschanze). See also Poland in general.